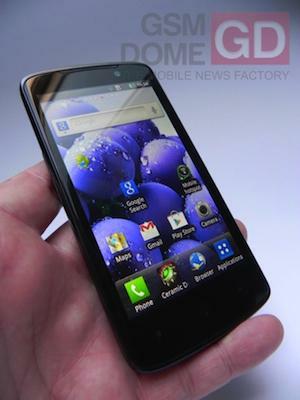 Leaked LG Optimus LTE P936 tipped for US release, but with which carrier? The LG Optimus LTE P936 made an appearance on the FCC’s certification roster last week, but little was known about the phone in terms of major features, or when it would launch. This changed today though, as GSMDome.com has published some pictures of a late prototype of the device, along with a series of specs and benchmark results. Equipped with a 1.5Ghz Snapdragon processor, a large screen with a 720p resolution and an 8 megapixel camera which can also shoot 1080p video, the P936 has a great specification. If you think the above spec looks familiar, you’re right, as it’s almost identical to the LG Spectrum and the LG Nitro HD. Although GSMDome have neglected to tell us the screen size and amount of processor cores for the P936, if it falls inline with these two, the screen will measure 4.5-inches, and inside will be a dual-core chip. The benchmark figure, demonstrated in the video below, also indicates it’s powered by one of Qualcomm’s dual-core processors. The Quadrant test shows a result of 2564, which is passable if not outstanding, but on a par with the Spectrum and the Nitro HD. The question is, if AT&T has the Nitro HD and Verizon has the Spectrum, who needs the P936? The answer could be Sprint. The network says the recent problems with LightSquared haven’t affected plans to launch an LTE service, and has previously indicated it would be releasing an LTE phone by mid-2012, so this could be it. When that will be, and what the P936 will be called when it does launch, is currently unknown.